The drag queen scene has increasingly infiltrated pop culture since the rise of RuPaul’s Drag Race in 2009. While the entertainment qualities of the reality show helped society accept, normalize and shatter myths about the drag scene, it’s time to make way for a new wave of innovative queens who are flooding social media with their approach to drag makeup. At the head of the alternative drag scene is Berlin’s @isshehungry. Using her expierence from studying fashion design and interning with Vivienne Westwood, Hungry created her own reality, using her body as a canvas. With over 115,000 followers watching post after post of breathtaking creations it’s easy to understand how Hungry has become one of the most talked about drag queens on the internet. 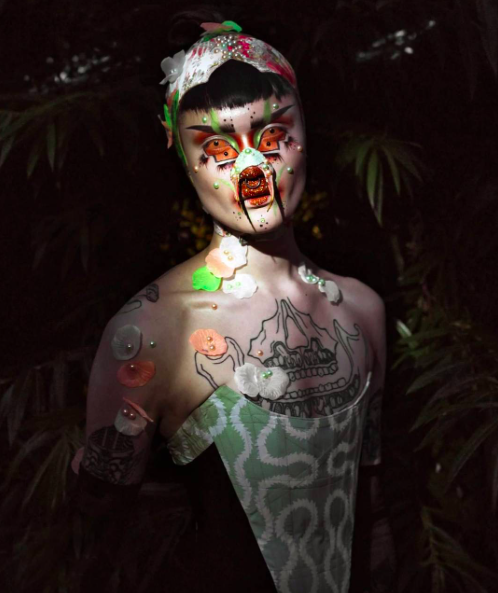 Hungry embodies a persona that is experimental and alternative, showcasing surreal makeup and producing original distorted drag. INDIE spoke to the Berlin drag queen about her introduction to the drag scene and how she learnt the skills to create her own reality through makeup and design. What prompted you to start drag in 2014? My two best friends dragged me out and we went out to a drag show. I really liked the reactions I got but it took another six months until I went out again and got offered a stage to perform on by Pansy (the ‘mother’ of Berlin’s alternative drag scene). Was it the introduction to the drag scene that prompted you to begin experimenting with makeup? When did you branch out into distorted and alternative looks? About one year into drag, when I moved to London I realized I didn’t have to be a ‘pretty’ queen anymore, so I went exploring. There were many ‘pretty queens’ at the time, but just as many, if not more, experimental and alternative queens and they were all very open and welcoming towards me. Very excited to announce, that @chloewaldorf and I will be giving this year's @makeupdesignoryde artist workshop for MUD graduates and make up artists! Link in Bio! Modelled by the stunning Jo Hyldgaard Workshop Day 2: Distorted Drag by @isshehungry The Masterclass for ethereal enigmas. Taking alternative Drag & Club Kid Make Up one step further and creating an avant garde artwork, Hungry will be illustrating one of her original and next level Distorted Drag Editorial looks, while Chloe Waldorf will be leading through the process. The artists will learn about unusual placement and balance of paint and prosthetics, followed by a hands on workshop with special focus on extreme drag contouring as well as character contouring. Did the Hungry persona evolve in tune with your experimental looks? It started out as a hobby and then got very therapeutic. By the time I moved to the UK, I already was pretty known in the Berlin scene, partly because it was a very small scene at that point and partly because I brought something different. In London I claimed the title ‘ethereal slag’ and went for an extraterrestrial witch vibe. Back in Berlin a year later the current Hungry surfaced with ‘distorted drag’ ranging from very insect-like drag to my own interpretations of gods. It’s my way of changing the world, my way of leaving a mark. You studied at MUD Studio Germany; do you feel like to learn the techniques of surreal makeup you have to study in a professional environment? My drag developed before taking the classes at MUD, but, had I had a proper drag class right at the beginning (like the one Chloe Waldorf and I will be giving in September) things would have definitely developed way quicker. I took the SFX class in Berlin, which taught me a lot about materials, glues and coloration, I could definitely recommend it. Your looks are a work of art, do you have any tips of people wanting to begin experimenting with surreal makeup? Take your time. Know your face. Typically how long does one look take you to complete? My make up usually takes two and a half hours. For garments, a full look takes about a week, sewing it from scratch. Have you worn your creations or ‘Distorted Drag Editorial’ looks elsewhere from events and parties? I take the train. I take the bus. I went to a mall. I often eat in drag. I don’t relate to reality anymore. What was your most time-consuming outfit yet? I’ve spent two months hunting down an iconic pair of unworn Alexander McQueen heels and then had no look to match, so I spent two weeks creating a fitted full body harness out of white leather as well as a matching headpiece with ostrich trimmings. It’s my Axolotl look. There’s so many facets to your looks, what is the beginning point of your inspiration? For new looks, it can be anything. I see a fabric. I see a color. Most of the times I start with the outfit, as I think I’m used to doing this from my studies. I see a headpiece and then I create a face to go with it. It’s always a full character. There’s no mixing and matching in my archive. Some are approachable, some are intimidating, some are completely unrelatable.